BLOGGER'S NOTE: This post is part of the Screenwriting Blog-a-Thon being coordinated by Mystery Man on Film. "I just met a wonderful new man. He's fictional but you can't have everything." The Countess (Zoe Caldwell): "Go with the real guy, honey, we're limited." Rita (Deborah Rush): "Go with Tom! He's got no flaws!" Delilah (Annie Joe Edwards): "Go with SOMEBODY, child, 'cause I's gettin' bored." Maybe if you're a character such as Delilah, especially a Depression-era stereotype, trapped in a movie that's stalled because one of the characters has stepped off the screen and into the real world, you'd be bored as well. However, if you are a moviegoer lucky enough to be watching Woody Allen's The Purple Rose of Cairo, boredom should be impossible. As far as I'm concerned, this film is Allen's masterpiece. Others will cite Annie Hall or Manhattan or some other titles and while I love those films as well, over time The Purple Rose of Cairo is the Allen screenplay that has reserved the fondest place in my heart. The screenplay isn't saddled with any extraneous scenes and no sequence falls flat as it builds toward its bittersweet ending. For me, it's Woody Allen's greatest screenplay and one of the best ever written as well. The Orion logo, a circle of stars in a starry sky, appears on the screen, followed by the official AN ORION PICTURES RELEASE. The screen goes black-and-white, credits pop on and off. All the while, Fred Astaire sings "Cheek to Cheek" in the background. That thud that interrupts Cecilia's reverie is a letter from the movie theater marquee announcing the next week's movie, The Purple Rose of Cairo. It also firmly establishes us in Woody Allen's look at Depression-era New Jersey and the escape movies offered for those barely scraping by. The Purple Rose of Cairo happens to be the first Allen film I saw in a theater, but it didn't immediately leap to the top of my list of his best movies. It took time and repeat visits to truly appreciate what a near-perfect specimen this bittersweet comedy is. I think part of the reason is that it is truly the only Woody Allen film that, if you took those familiar black-and-white credits away, you wouldn't recognize as coming from the writer-director. He's not aping Bergman. There is no character serving as the Woody surrogate either in a good way or an embarrassing way (think Kenneth Branagh in the god-awful Celebrity). It's the perfect blend of comedy, fantasy and realism and one of the greatest depictions of the magic of movies ever put on film. Buster Keaton might have mixed the real world and the movie world in Sherlock Jr., but it was all a dream in the end. In The Purple Rose of Cairo, when Tom Baxter (Jeff Daniels) and his pith helmet step off the screen, the repercussions end up being both hilarious, touching and painfully real. Allen manages to create several complete universes within his 1930s New Jersey. There is the comedy of the characters trapped in the black-and-white world of a movie story that has nowhere to go when Tom departs. There is the drama of Cecilia's bleak existence with her abusive husband Monk (Danny Aiello). 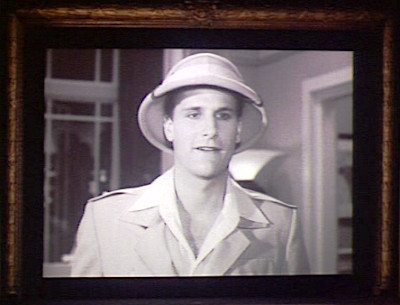 There is the romance of Cecilia's adventure with the fictional Tom. There is the blend of satire and straight story as Hollywood descends on the town to try to put a lid on a brewing scandal and to stop Tom Baxters from leaping off the screen elsewhere in the world. The merging of these worlds create a most unusual love triangle as Cecilia is torn between the perfect but two dimensional Tom and the real-life actor Gil Shepherd who brought him to life. Either one would be an improvement over life with Monk. Don't get me wrong that this is a "serious" Allen. There are a multitude of laughs, but very few seem to come from his usual sensibility. There are ample laughs wrung from the situation of a the fictional Tom wandering around New Jersey and encountering prostitutes and the need for real money. The characters still trapped in the film also provide plenty of opportunities for laughs. The person though who keeps the entire film centered and deepens it beyond mere comedy is Farrow. She gets some laughs, but her plight is heartbreaking. Cecilia always found her escape from her miserable life of poverty and an abusive husband in the movies and now the movies offer her a chance for true permanent escape, either with a character who doesn't really exist or with the actor who could show her an entirely new life in Hollywood. Daniels has the most difficult role and he handles it well. Tom is truly guileless and naive because the actor who created him just isn't that good an actor. On the other hand, Daniels' performance as the actor shows how far charm can carry you even when you're obsessed with your career. In the end, when Cecilia sees that her only future lies with Gil, not a two-dimensional character come to life, her blinders don't allow her to see that she's being played, though even Gil seems to have regrets as he quickly gets the hell out of New Jersey. 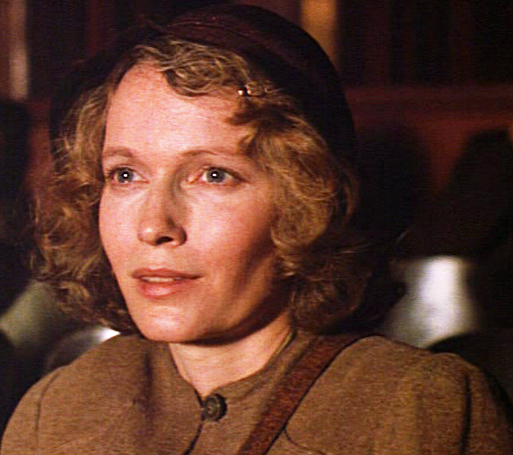 What really lifts The Purple Rose of Cairo into the realm of the transcendent is its ending. Certainly, it's sad that Cecilia loses both her leading men and has to return to Monk, but it shows the true love of her life is the movies as she wanders, despondent, into the theater and sees Fred Astaire and Ginger Rogers dancing up a storm again. However, she's saved by the movies and her sadness lifts, if only for that brief time that she's safe there in the dark. This is a nice tribute to a Woody Allen film that I've passed over after only seeing once or twice. I'll have to revisit it here pretty soon. I just revisited it, and I concur. I liked it more than the first time. I'll need to see it yet again.